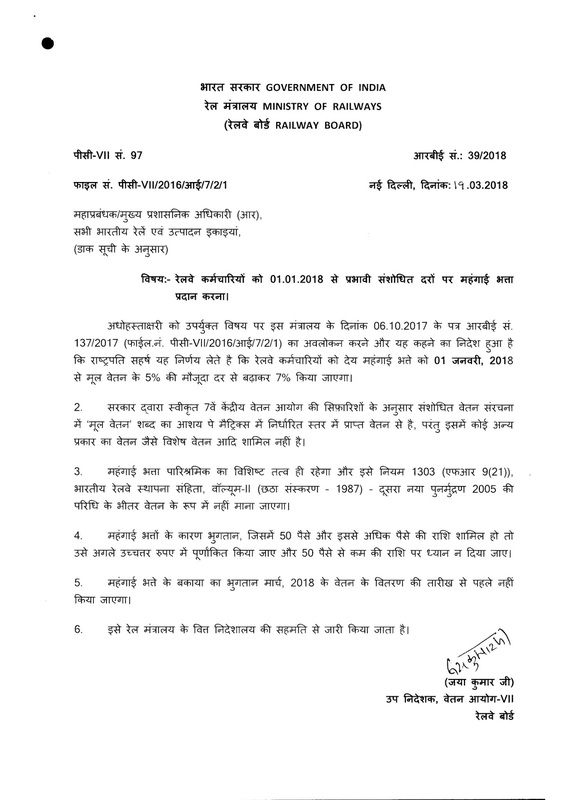 Sub: Grant of Dearness Allowance to Railway employees - Revised Rates effective from 01.01.2018. The undersigned is directed to refer to this Ministry's letter RBE No 137/2017 dated 06.10.2017 (F. No. PC-VII/2016/I/7/2/1) on the subject mentioned above and to say that the President is pleased to decide that the Dearness Allowance payable to Railway employees shall be enhanced from the existing rate of 5% to 7% of the basic pay with effect from 1st January, 2018. 2. The term 'basic pay' in the revised pay structure means the pay drawn in the prescribed Level in the Pay Matrix as per 7th CPC recommendations accepted by the Government, but does not include any other type of pay like special pay, etc. 3. 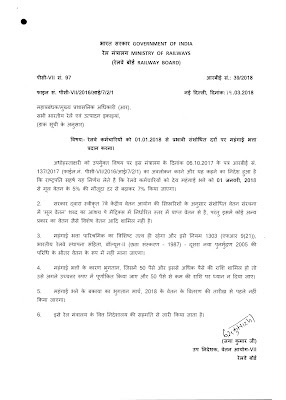 The Dearness Allowance will continue to be distinct element of remuneration and will not be treated as pay within the ambit of Rule 1303 (FR 9(21)), Indian Railway Establishment Code, Volume -II (Sixth Edition - 1987) - Second Reprint 2005. 6. This issues with the concurrence of Finance Directorate of Ministry of Railways.